A 56-45 home victory over the Columbia Eagles in the final Region 5-5A regular season boys’ basketball game sealed the tournament’s No. 1 seed and an automatic bid into the Class 5A state playoffs for the No. 4 ranked Southwest DeKalb Panthers. The Panthers trailed 6-2 with 3:47 left in the first quarter on an offensive put back by Columbia’s Liron Thomas, but a drive by KD Johnson followed by James Glisson’s three-pointer from the top of the key on an assist from Johnson they took a 7-6 lead and never trailed again. Southwest took a 13-8 lead into the second quarter with a Wytavis Searcy layup on an assist from Jarrett Walton and two free throws by Johnson in the final 28 seconds. Three-pointers by Chandler Sanders and Walton in the final 2:46 of the half helped the Panthers to a 25-17 lead with a minute remaining. A pair of quick turnovers by the Eagles led to another Walton basket and then a one-handed dunk by Johnson sent the Panthers into the half up 29-19. Sanders would hit two more three pointers in the third quarter to push the Panthers up 42-28 with one quarter to play. Columbia was able to cut the lead to nine twice at 52-43 on a Thomas three and then 54-45 on a Thomas drive to the basket with 1:48 to play. 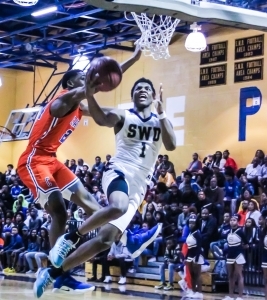 Johnson found Rion White under the open on a drive down the baseline for an easy dunk with 1:37 to play that sealed the 56-45 victory for Southwest DeKalb on senior night. The loss has Columbia Head Coach Phil McCrary holding at 599-212 at one win away from an historic 600th career victory. James Glisson finished the night with a 15-point, 10 rebound double-double to lead the Panthers (19-6, 11-1). Jarret Walton with 11 and KD Johnson with 10 joined Glisson in double figures. Liron Thomas had a game-high 24 to lead the Eagles (13-9, 6-6) as they get the No. 3 seed behind the No. 4 Panthers and the No. 7 Lithonia Bulldogs (16-8, 10-2). Jayla Kimbrough hit four consecutive free throws in the final 11.8 seconds to give the No. 4 ranked Southwest DeKalb Lady Panthers a 54-51 Region 5-5A senior night win over the Columbia Lady Eagles. Columbia had rallied from as much as 14 points down early in the third quarter to take a brief 51-50 lead with 34 seconds to play in the game. 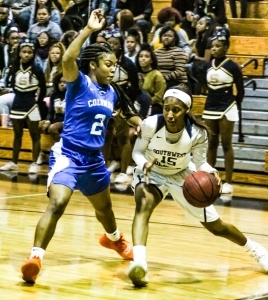 Trailing 49-44 with 1:49 to play the Lady Eagles took advantage of a Southwest DeKalb turnover with Daija Carr cutting the gap to two with a three-pointer from the right wing on a nice assist by Constance Johnson. A steal and layup by Johnson tied the game at 49-49 with 58 seconds to play before Kimbrough hit one of two from the line to give the Lady Panthers (19-6, 12-0) a short-lived 50-49 lead with 46.3 seconds remaining. Johnson struck again with a drive for the go-ahead basket for the Columbia lead. Columbia (18-6, 8-4) got a steal on Southwest DeKalb’s next possession, but gave it right back trying to pass down the court. Kimbrough was then fouled with 11.8 left on the clock and promptly netted both free throws to make it a 52-51 lead with Columbia getting the ball. A turnover out of bounds by the Lady Eagles had Southwest inbounding the ball on Columbia’s end of the floor and Kimbrough was fouled on the inbounds. She went to the line with 2.0 left on the game clock and calmly hit both free throws to make it 54-51. A long desperation three at the buzzer by Columbia was short as Southwest DeKalb held on for the win. Trailing by 14 early in the third quarter Columbia used a 10- run to pull within 36-32 with 3:19 to play on a Johnson basket. India Terrell had a drive to the basket and then hit a long three from well past the top of the key just before the end of third quarter to pull Columbia within 44-39 with a quarter to play. Raven Thurman hit for 14 points to lead Southwest DeKalb followed in double figures by Adrieanna Brownlee with 12 points and 9 rebounds and Kimbrough with 11 points. Johnson finished with 17 and India Terrell knocked down 15 points.